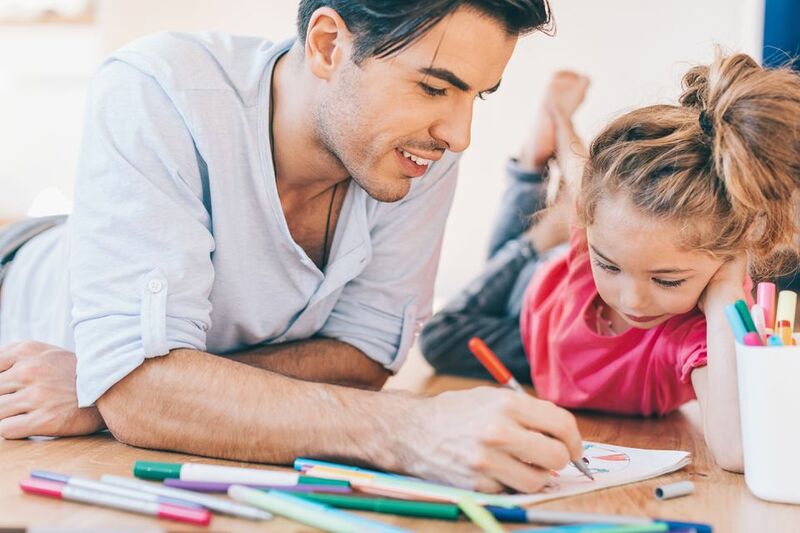 Father's Day coloring pages are a great boredom buster for your children, and when they're finished, they make a great Father's Day gift for dad. It can even be a fun activity for dad and child to color on Father's Day. All these Father's Day coloring pages are free, and you can print them right from your home computer. The fun images of dads spending time with their kids and other traditional Father's Day images will put a smile the kid's and dad's faces this Father's Day. Have the kids sign their name and write a Father's Day message on the back, and they have a card and a keepsake all in one. Some other Father's Day freebies that you might like include Father's Day coupon books and printable Father's Day cards. TheColor.com has a great group of Father's Day coloring pages that feature dads, kids, blocks, animals, gifts, and awards. These Father's Day coloring pages can be colored online and printed or printed and then colored with crayons. Hallmark has some unique Father's Day coloring pages that include bears, lions, giraffes, and different sayings that celebrate dad. Click on a thumbnail of the coloring sheet you'd like to print and a PDF file will open allowing for easy printing. Print and color Father's Day coloring pages of dads, dads and kids, grills, golf balls, fish, ties, and trophies all at Coloring.ws. If the kids are looking for more than just Father's Day coloring pages, there are also several cards to print and color and a connect-the-dots. 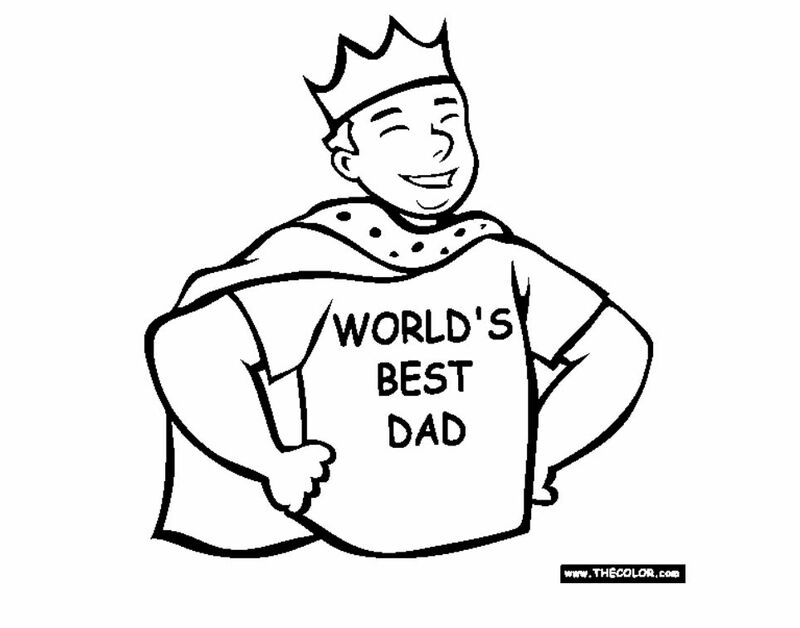 There are 3 pages of fun-filled Father's Day coloring pages over at Coloring Pages for Kids. In addition to the traditional Father's Day coloring pages, there are also coupon coloring pages that dad can redeem for free hugs and kisses. The Father's Day coloring pages at DLTK can be printed as traditional coloring pages or as posters. Besides Father's Day coloring pages there are also Father's Day themed tracer pages and a poem poster. These free, printable Father's Day coloring pages feature images of golf, ties, and dads having fun with their kids. You can print these Father's Day coloring pages by clicking the page you'd like to print and then using the printer icon to get an ad-free page. Crayola has a handful of free Father's Day coloring pages that include fathers and sons, daughters and sons, fishing, picnics, baseball, barbecuing, and relaxing. Click on the coloring thumbnail and use the Print Now button to print it without ads from your browser. There are almost 20 free Father's Day coloring pages at Twisty Noodle, including color by number sheets. All the coloring pages at Twisty Noodle can have their own custom title and a choice of four fonts including a tracer. You'll find images of dads, kids, banners, coffee mugs, cars, balloons, and more in the free Father's Day coloring pages at Coloring Book Fun. Click on the Father's Day coloring page you'd like to print twice to get a version with no ads. Educational Coloring Pages has a small but great collection of free Father's Day coloring pages. Click on the image once and then use the printer icon to print these Father's Day coloring pages. There are only a handful of free Father's Day coloring pages at Doodle Art Alley. Besides the coloring pages, there are some additional printables that include a web for filling in what you like about Dad and a printable Father poem.